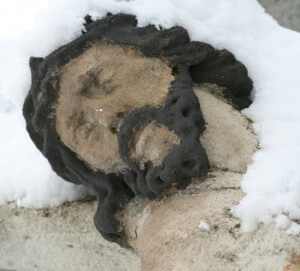 Meditating on the sufferings and death of Jesus ought to be a principal part of the Christian’s devotion during the time of Lent, because the time is approaching when we commemorate the yearly memory of Christ’s passion. Therefore, we need to focus on the crucified Saviour and make him the object of our devotion. His passion is an ever-flowing source of mercy, grace, and salvation to us, since all that is good flows from his cross. The more we approach him in his sufferings and place ourselves near the cross through our meditations, the more plentifully we partake of that mercy and grace. As the great aim of Lent is that sinners should return to God, what better means for this return could we have for this than through the sacrifice of Christ? We do this by daily meditating on his passion. Such meditation will naturally lead us to the meaning of the Cross in terms of our eternal life. In this way, asking for God’s forgiveness and attaining his mercy for reconciliation with him naturally arises within us. In spite of all these great benefits of the Cross, many Christians are forgetful of the suffering of their Redeemer. So many, who would be his disciples, flee before the stark reality of his wounds, torments and agonies. They refuse to endure the experience of the Cross even second-hand, How often Jesus is left alone and no one knows him. (Psalm 112) Let us never be so lacking in our gratitude and love of Christ that we forget, leaving him alone on the Cross. Considering the passion of Christ is the sovereign means of all good to Christian souls. As Moses lifted up the serpent in the desert, so must the Son of man be lifted up, Jesus told Nicodemus, so that whoever believes in him may not perish, but may have everlasting life.‘ (John 3:14, 15) Such contemplation of the passion of Christ is the great means to heal Christians from temptations that God has forbidden. Now, it is in meditating on the passion of Christ that we contemplate the object of our faith and the ground of our hope. This leads us to repentance for our sins, whatever thise may be for us personally. As the belief of Christ crucified is the most fundamental article of the Christian’s faith, so it has the greatest influence of all other aspects of our justification. According to the Apostle, we all have sinned and need the glory of God; being justified freely by his grace through the redemption that is in Christ Jesus, whom God had proposed to be a propitiation through faith in his blood. (Rom. 3:23, 24, 25) Here you clearly are told that it is through faith in his blood that we are introduced to divine mercy and it is through contemplation on his passion we are brought to a faith, which is alive and thriving. Devotion to the passion of Christ influences our hope by setting before our eyes how much God loved us in giving his only Son. (Rom. 8:32) Here we discover the incomprehensible goodness of God and the inexhaustible treasures of his divine love for us. This excites in us a desire of returning love for love&mdaash;our life for his life. This makes us grieve for our past ingratitude, when we had little sense of his goodness and love. This makes us lament the share our sins have had in nailing him to the cross. This teaches us to offer our whole hearts to him. Conclude to put yourself at the foot of the cross in your repentance and by contemplation of his sufferings to let yourself be happy in hope and love. In this way you will secure for yourself mercy, grace, and salvation. Devotion to the passion of our Lord brings with it other great advantages to the soul, since it teaches us many lessons regulating our lives according to his example. He gives us a perfect pattern of all the virtues for us to follow in the practice of our lives, so that we might always live according to God’s intentions for us. Although the whole life of Christ is full of admirable examples of all the Christian virtues, yet nowhere do they shine more brightly than in his passion. Here, he has drawn together all the great lessons of virtue he had taught in his life both by his words and his works. Here is the ultimate act of love. The Apostle tells us that the more particular lessons we are to learn from the Passion of Christ are those principally of his obedience and his humility. (Phil. 2:5, 8) As Adam fell from God by disobedience in transgressing the holy law of God, so by the obedience of the second Adam, Jesus Christ, we are delivered from sin and death. This is the obedience that Christ expects we should learn from his cross, so as to be always willing to part even from our dearest affections, rather than offend our God and to submit to any sufferings whatsoever rather than to disobey him. This is true Christian obedience, and nothing less will bring us to union with God. Consider the lesson in humility Christ gave us in the course of his passion, becoming the reproach of men and the outcast of the people. (Ps. 21:7) See how he humbled himself under those infamous torments of scourging at the pillar, crowning with thorns, and the carrying of the cross. This teaches you about his humility—a lesson so necessary that without learning it you can never please God. Study these necessary lessons for the Cross is the pulpit from which Our Lord most effectually preaches to our souls.